Is the Peasantry in the Tiny State of Himachal Heading For a Major Crisis? Despite the state being largely rural, the contribution of agriculture in the state’s gross domestic product is reducing considerably. The state of Himachal Pradesh has a predominantly rural population. Ninety per cent of the people here live in villages. There are 17,882 villages and about 59 urban settlements including two municipal corporations. There are more than 14.9 lakh families in the state. The total number of workers according to the census data is 35,59,422. Nearly 58 per cent of these workers are kisans and practice farming as their main occupation. The number of landlessness is increasing which has resulted in a corresponding increase in agricultural workers in the state. Despite the state being largely rural, the contribution of agriculture in the state’s gross domestic product is reducing considerably. It has fallen from 14 % to 9.40 % in the last 5 years. This fall has been in the form of a linear regression for the last 3 decades. In the year 1980 it was 35 per cent, 1990 -26.51 per cent, 2000- 26 per cent, 2010- 21.07 per cent and by 2017 it fell to 9.4 per cent. Only 30 per cent of the rural population is dependent on agriculture. Seventy per cent sustains itself through non-agricultural operations. This is also because a large number of people have left agriculture as it has become non-remunerative for them. The land holdings have also fragmented and increased. With meagre land per holding, it is difficult for peasants to survive on and continue with agricultural operations. 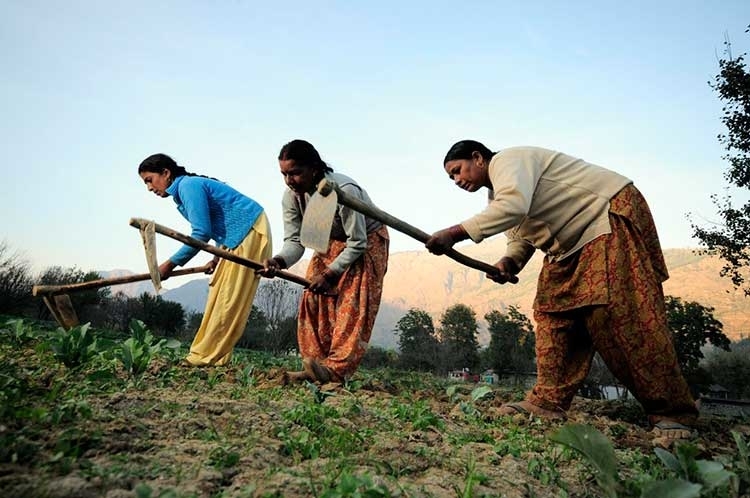 Small and marginal farmers (less than 2.0 hectares of land) constitute 87.95 per cent of total peasant population and have 54.17 per cent of the total land. This amply shows the basic contradiction developing in the villages of Himachal. The land holdings are increasing but the land per family is reducing substantially. It leads to the shift in non-agricultural operations. The iniquitousness of the equity in wealth while carrying out such operations can be gauged from the fact that 53 per cent of rural families have an income share of less than Rs. 5000 per month. This is in the background where 23.87% of the rural families are in government jobs (owing to the large services sector that was developed in the past). Sixty six per cent of the SC families have an income of less than Rs. 5000 in rural areas. This shows that those families/individuals living in villages are not government employees and their economic condition is extremely bad. Their income has fallen rapidly in the last 2 decades. According to the data from various sources, a large portion of the earnings is spent on providing essential services which have either been privatised or commoditised by the government itself. These services include health, education, electricity and even water. Land is an important issue in the state. Only 11 % land (5,43,365 hectares) is tillable. The average land per holding is less than 0.5 hectare. This cannot be remunerative in the given situation. People have also encroached on land around their houses. Interestingly, all fallow land in Himachal is forest land. Hence such encroachments are seen as an evil design of the farmers. The poor, Dalits and marginal farmers have become victims of the ire of the courts and the government. Earlier (prior to 1980), ‘new taur’ used to be followed. This meant that the government would break new land and would distribute it to the landless for their survival. To ensure that they do not part away with such land, riders were added and section 118 of the land reforms and tenancy act was brought in where the land could not be bought by a non-agriculturist in Himachal. Even if somebody was staying in the state for many years they could not get the right to purchase land there. The present BJP government on the one hand intends to evict farmers from their land which they have been tilling for decades and on the other hand is trying to ease section 118 to ensure the land sharks, mainly of adjoining states, can buy land in the state. This will further dispossess the people, especially those who are small and marginal land holders. The crisis in the peasantry of Himachal is looming large. Small land holdings and the loss of ‘state support’ in carrying out agricultural operations is the major challenge before farmers in the state. There is another loss happening, which in the past had helped mountain agriculture to sustain. That pertained to the strong service sector being developed over a period of time (1970-1995). This had helped in complementing agriculture as someone from almost from every 3rd house was involved in a government job. This government job was and is needed to ensure that basic services in the state remain strong. Unfortunately, successive governments, in their paranoia to contain fiscal deficit have reduced the number of human resources in these sectors of social importance. The hardest hit sectors being health, education, electricity and the public works. More than 100,000 jobs have either been scrapped or declared as dead cadre. These important services are now being outsourced to delivery departments. Contractualising is another method of getting the work done. So, the land issue does not just get affected by small land holdings but also by the withdrawal of support from a state that was quite promising in the past. This has compounded the problem. Further, if a study in the cropping pattern is done one would find that only a few crops are remunerative. These are - apple cultivation, off season vegetables production and in a few places stone fruits production. In the rest it is just subsistence agriculture that is being practiced. The PMs euphoric speech of doubling the farmers’ income is a mere mirage. The land under apple cultivation is very less. It is just 6.6 per cent of the total tillable land. Similarly, for other fruits it is just 2 per cent. The land for vegetable production is just 3.2 per cent of the total. These are the crops (apples and vegetables) which are remunerative. This means that in 89 per cent of the state’s tillable land, the kind of agriculture practiced is for subsistence only. Another major reason for such a situation is that the successive state governments have not paid heed to irrigation. The total land under irrigation has also decreased from 19 per cent to 16 per cent. This means that 84 per cent of the entire sown area is dependent on natural water through rains or snow. No surprise that the percentage of barren land has increased from 4 per cent to 14 per cent. The state is heading for a major crisis which is interwoven with the governance that is prevalent. With BJP in power, the situation seems to be worsening as the major resource- land, which should have been used as an asset to increase the people’s income is being targeted. On the one hand through coercion with the withdrawal of the state support, the people are forced to leave agriculture as continuing with it is a huge challenge. On the other, it’s being facilitated for the land sharks through the easing of section 118 to grab land in the state thus causing small and marginal farmers to lose their land.